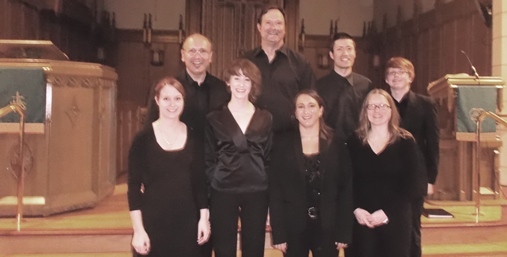 It was really interesting to hear the familiar music in such a different arrangement and nice to note that the choir has two very young new members – Marieke de Korte, soprano and Russell Sweeney, tenor, both of whom are recent High School graduates. The main portion of the concert began with two sacred motets by Giovanni Pierluigi da Palestrina (1525-1594) embodying the polyphonic writing for which he is famous. The first had a flowing melodic line to signify running water; and the second was a much more solemn piece with emotional undertones. The eight voices were perfectly suited to this music and each singer seemed to enjoy and be proud of the precision with which they delivered each note. While we were listening to ethereal music, famous paintings were being displayed on the overhead screen. Works by Da Vinci, Michelangelo and Botticelli added to our experience. Whoever chose them did well, adding nicely to the atmosphere. Missa Ecce Ancilla Domini by Guillaume Dufay (1397 – 1474) was the central work of the evening – very early music indeed. It is a mass in five parts which refers to the Annunciation – when the angel Gabriel delivered the news to Mary of her upcoming pregnancy. Each movement of the mass is begun by a tenor (Michael Taylor) singing long sustained notes which become the unifying force of the whole mass. During this we saw famous paintings of the Annunciation by Fra Angelico and Leonardo Da Vinci – beautiful music and beautiful visuals. Maestro Potvin decided it needed an Alleluia, so he wrote a fine one to finish it off. The evening was rounded out by three madrigals, again by Palestrina, that moved from lovesick heartache to appreciation tinged with regret and finally to majestic drama. Colourful music beautifully sung by choir members who looked as though they were enjoying themselves. The appreciative audience was treated to an encore. A French song called La Guerre set during the French/Swiss War and celebrating a battle the French obviously won judging by the ‘victoire’ sung in forceful repetition. The next Musikay concert is “The Messiah” on Saturday, Dec. 20th. For subsequent performances, perhaps the maestro will include some more contemporary works; to create greater interest. “In Remembrance”; the concert and personal. Take Me Back to Jefferson”; a funereal voyage of principles.